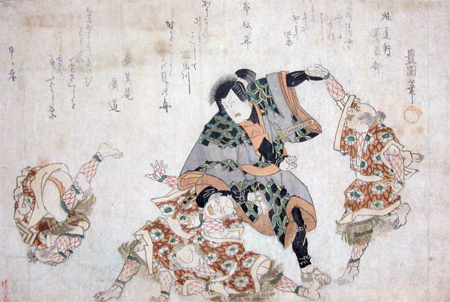 The martial art of Jiu Jutsu was developed by the Shaolin Monk order, and quickly became known as the most effective defensive style when Shaolin monks started defeating all and any opposition in tournaments and contests (sumo wrestlers gave them a run for their money at first, but they soon adapted a more aggressive approach against the massive wrestlers). Another defensive art, Aikido, is practiced by some, but it has its shortcomings compared to Jiu Jutsu. Whenever someone attacks you, regardless of whether they actually hit or not, you can chose to use an attack to try to counter their attack. normal parry rules apply (DC = opponent’s hit + 12). If your attack is successful, you negate their hit (with a few exceptions). Only characters who start out in Vest, Solriket or den Gylne Keisers rike can chose Jiu Jutsu at level 1. Other characters either have to travel to said countries to learn it or practice under someone who knows the art already. Jiu Jutsu cannot be used aggressively, only to counter attacks. And since it is an unarmed combat style, you cannot be armed when using it. In addition, it cannot be used against armed opponents until you have designated 3 slots to the art. Also, you can only use Jiu Jutsu against humanoids up to one size category larger than yourself. When using Jiu jutsu, you get as many counters as the art allows you, and they do not count towards your attacks/actions the next round. The first slot gives you +1 attack, +1 hit/dmg and +1 modifier on the Jiu Jutsu table. The second and subsequent slots give you +1 hit/dmg/table modifier. The third slot allows you to use Jiu Jutsu against armed opponents. *The opponent ends up on the ground and must use a move action to get up or continue fighting on the ground. **You take damage if you were hit, but can be quite powerful if you also know Dim Mak. ***See wrestling rules on Locks. Choke Locks also makes opponents pass out if they are unable to free themselves when it’s their turn. They die after 1/3 CON rounds if the lock is maintained. ****You take damage if you were hit.